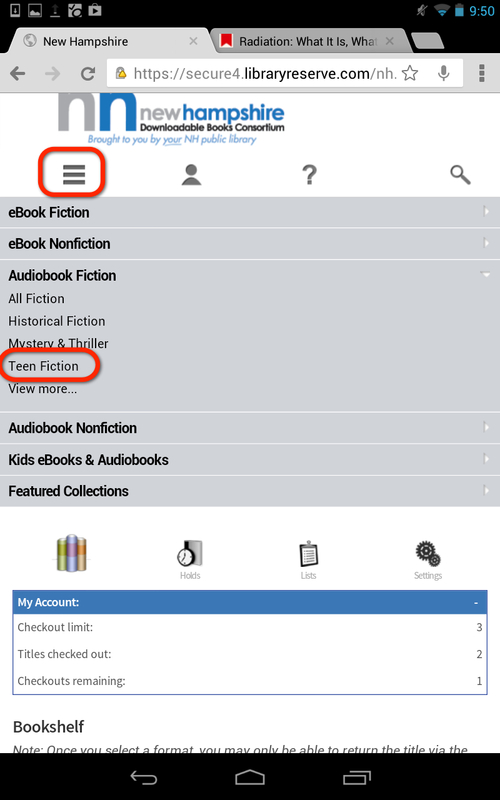 Note that it is also possible to download MP3 audiobooks to a Windows or Mac computer and transfer the MP3 audiobook to the mobile device with a cable directly to the device's music player. Apple products and other WMA-compatible devices can also play WMA audiobooks, provided the WMA audiobook is first downloaded to a Windows computer and transferred to the device with the use of a cable and the OverDrive Media Console for Windows (and iTunes when using an Apple device). Note that from the list of devices above, only the Apple devices can be used to listen to the WMA audiobooks. Read more about transferring a WMA audiobook to an iPod from a Windows computer. Read more about transferring an MP3 audiobook to an iPod from a Windows computer. 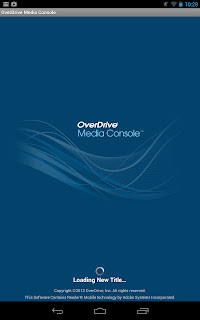 Install the OverDrive Media Console on your mobile device. Each device provides access to an app store. Here is an example of getting the app for the Google Nexus 7 Android device. Note that you may be prompted to register the app with a free Adobe ID. This is only necessary if you plan to read Adobe EPUB eBooks. 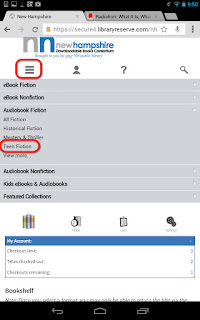 It is not necessary to register the app to listen to MP3 audiobooks. Log into the NHDB site through the mobile web browser or the OMC app's mobile browser. Either method works equally well. I typically use the mobile browser (Safari, Chrome, etc.) to browse the NHDB site. 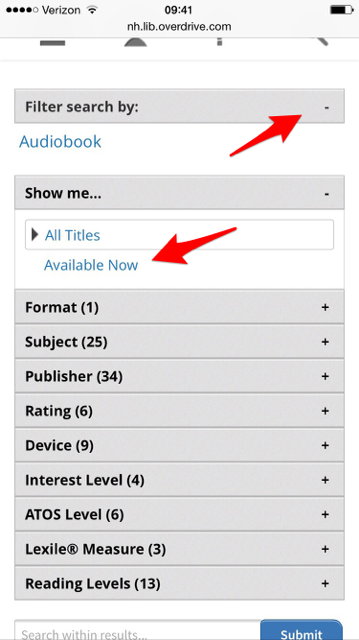 After logging into the site, click the "menu" icon and select an audiobook genre to start browsing. The titles are automatically sorted by the newest added to the site. To see titles that are available to borrow immediately, click "Available Now." Update (3.3.2015): The "Available Now" button no longer exists. 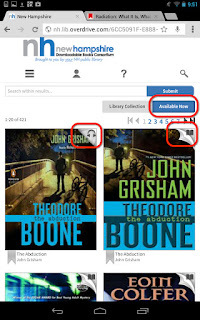 It's now under Filter search by:"
When you see an audiobook that looks appealing to you, tap on the cover to view more about the book. If you want to read more, tap on "More." 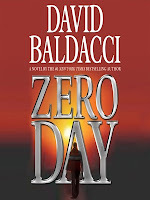 Press "Download" to start downloading the audiobook. 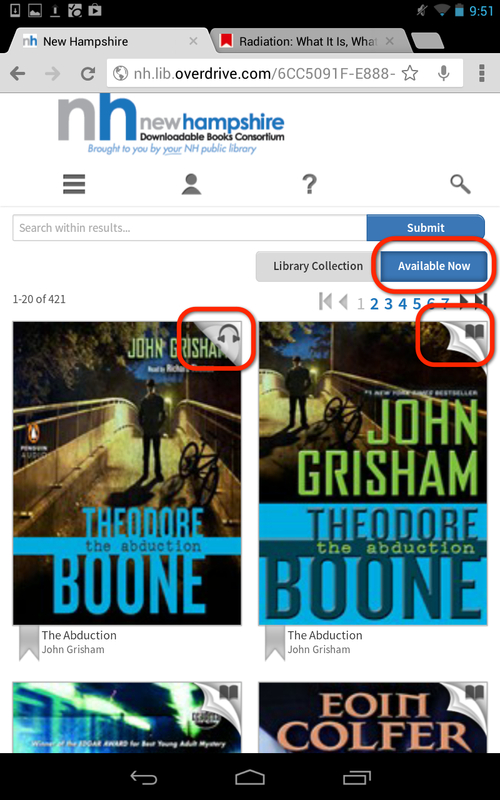 Note that mobile browsers will not display WMA audiobooks. Apple/Safari Users: Don't be alarmed to see a new page load that asks if you how to open the file. Always open this file in the "Open in "OverDrive." option. The OverDrive Media Console opens automatically. Note that audiobook files are very large. Take care when downloading audiobooks on your mobile device's cellular network. 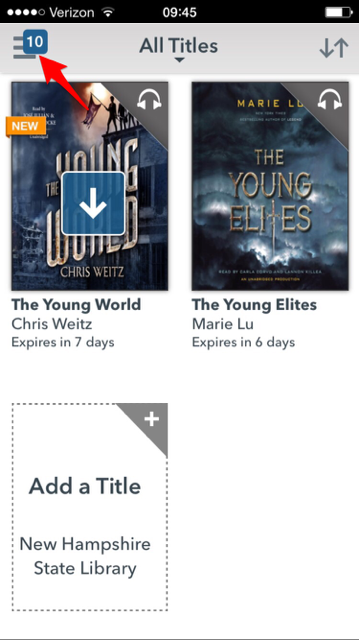 You may wish to wait to download the audiobook until you have access to a wireless network. The number displayed in the upper-left corner is the number of parts waiting to be downloaded. Tap on "Files" to manage your downloads. Once one part has downloaded you can start listening to the audiobook! 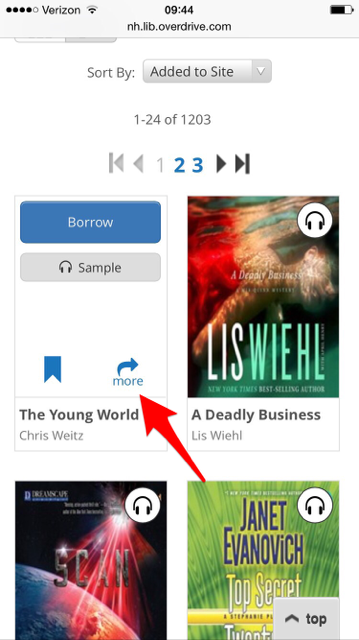 Tap on the book cover to open the audiobook player. Return to the Bookshelf by tapping the three horizontal lines to the upper-left of the screen. Then tap "Bookshelf." 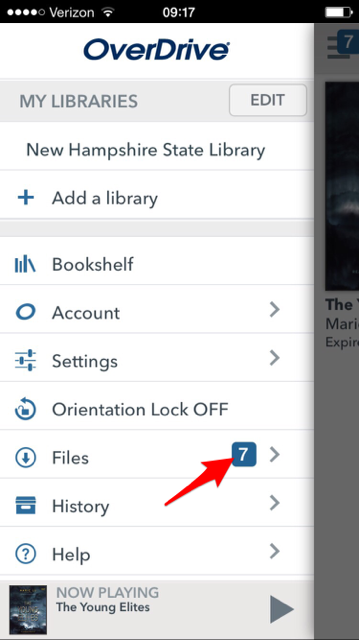 The OverDrive Media Console mobile app will automatically block your access to the audiobook after seven days, removing it from your account and prompting you to delete the title from the app. 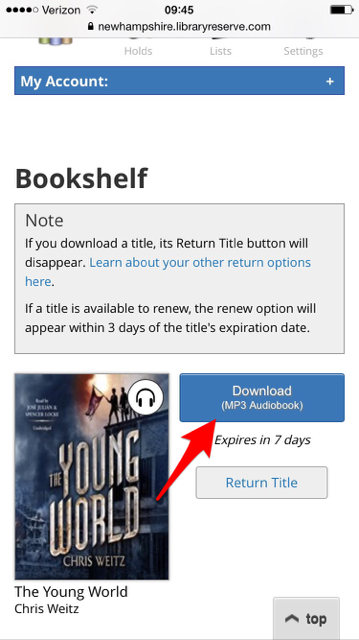 But if you finish the audiobook early, you can return the MP3 audiobook to the collection from the OMC app. From the app's bookshelf, long tap on the book cover to return the item.